One of the neat features of Google Photos is that it can automatically create videos around certain ideas. Just select a theme, choose the people (or pets, depending on which theme), and Photos takes care of the rest. Now, a new, couple-focused theme is available: Love Story. 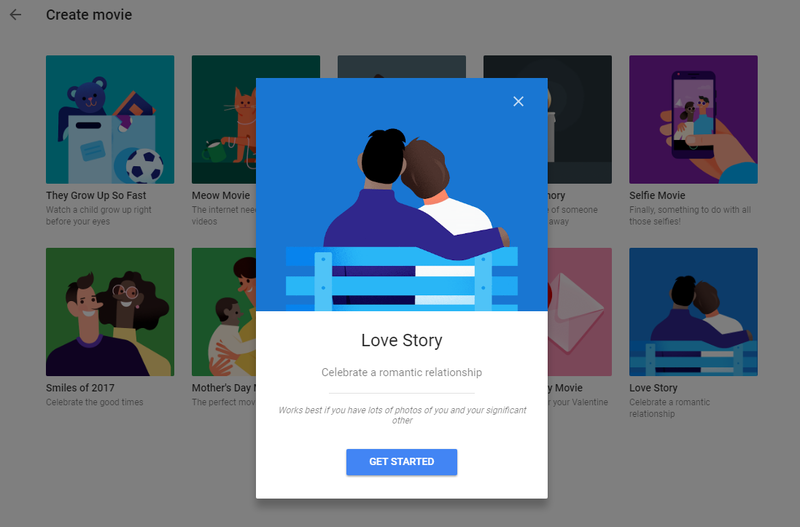 The card for the Love Story theme says it's designed to "Celebrate a romantic relationship," and that it works best if you have a lot of pictures of yourself with your significant other. It doesn't automatically identify you, though, so you could theoretically make a video about any two people, if you had a reason to do that. Love Story joins nine existing themes, including a Valentine's Day theme introduced in February. The two concepts are obviously pretty similar; I tried both, and the results were nearly identical, each featuring acoustic guitar music over the same set of photos in the same order, although the Valentine's movie included one additional photo at the end. To make your own movie, open up Google Photos, select the Assistant tab, then tap the green Movie icon at the top.